This piece is based on one of those now anonymous portraits of wealthy townsfolk from the northern Renaissance. What separates this man from his fellow merchants is a remarkable ability to stretch his epidermis to considerable distance. This is a common attribute of Ehlers-Danlos syndrome. 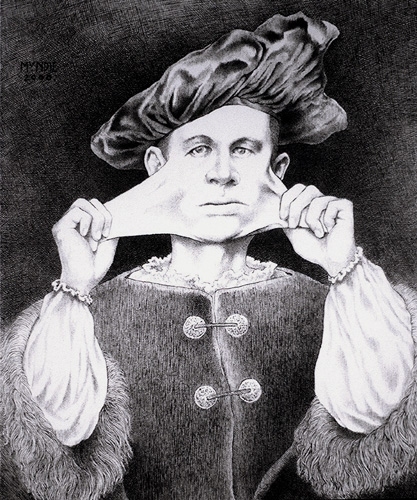 People born with this condition generally also have rather unusually flexible connective tissue in their joints, which enables some to perform feats of contortionism more easily than the less pliable among us; hence, these performers were commonly called "the Rubber Man" or some such elastic reference. Perhaps this ability would have aided this fellow in selling cheese or tulip bulbs.